I am Roystone C.G. Fernandez. I am writing to your regarding the Vanspall family tree. My late Grand Father Mr. Cyril Anthony Godfrey Fernandez had this letter in his possession. He was from Telicherry(Near a Convent) in Kerala, India. 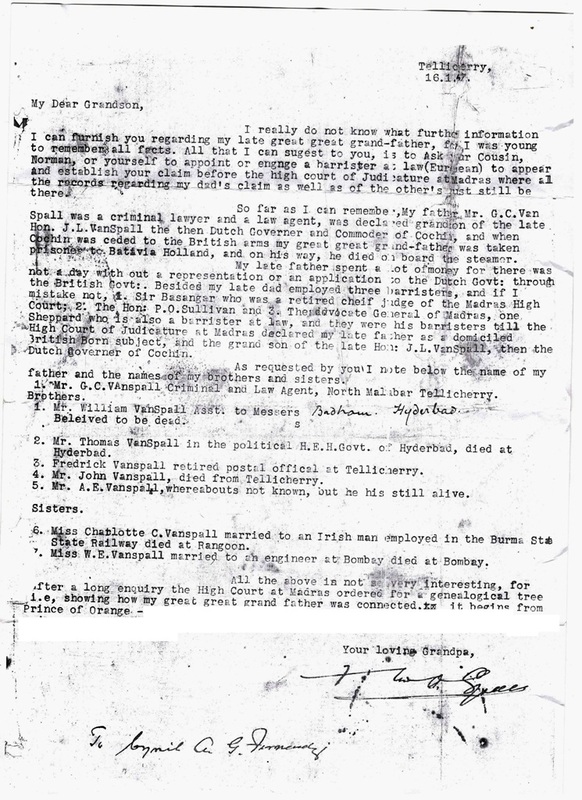 This letter was given to him by his Grandfather. I hope to find out more about my family history. I hope that this would help you to help me out. Yours Sincerely, Roystone Fernandez. Mellie Vanspall married Gertrude ? (Hubli). No children. Nadine Fernandez (married Denzil Joseph Paris from Villupuram). Children - Cecila Wood (Australia), Renza, Marissa, Oslyn (Australia), Gertrude and Maxwell Mario. Lyra Fernandez (married Babalola from Nigeria). Children - John, Philip, Mary, Ruth and Joshua.